But I am not JUST a food lover. I also have a humongous, gigantic, massive sweet tooth (As you can tell from my cheeks) and when CakeZone reached out to me for a cake review, I was absolutely delighted. Knowing I had a cake box waiting for me at home in my refrigerator was enough motivation to help me get through my long and boring day. So, let’s just cut the story and get to the mouth-watering part, alright? My first analysis was of the packaging. I wanted to see how much effort this place put into its boxes. So, that was the first thing I did. Maybe I have seen the best of the best in Hyderabad, or perhaps I am difficult to please when it comes to art and beauty… but the cake box was a huge letdown. It was just that square box we’ve been seeing from childhood. Plain and boring. Also, it was yellow, of which I am not a fan. Here’s my suggestion to the management. Please try and spruce up your packaging because as shallow and silly as it sounds, appearance really does add a LOT to the marketing strategy. People are attracted to beautiful things and your job is half done when you invest in the outside because that is what people see first. Make it fancy, make it your own individual style, make it colourful… but mostly, make it stand out. Obviously, this is the most important part. I got a Red Velvet cake because though I have tasted multiple of these before, I wanted to know what the craze was all about. To be honest, I am not a fan of this flavour which is why I will not mention my opinion alone in this review but will conglomerate the opinions of six other people who tasted this cake (mostly Red Velvet lovers). On the outside, the cake looked very beautiful. Extra points for that. What lacked in the box, definitely made up in terms of how the cake looked. In a combination of red and white, it glistened within, utterly scrumptious and delightful in the simplest way. I almost didn’t want to cut it. The moment I put the knife on the cake, it sliced through beautifully, feeling so soft and filled with moisture, just like it should be. It didn’t fall apart, it didn’t crumble and it stayed perfectly intact. The icing remained fluffy and the layers within were beautiful. Overall, it was picturesque. This is obviously the most important factor of a cake. First, the pros. It melted in the mouth the moment I tasted it. It was moist and fluffy. That is one of the best things about a cake. I thoroughly enjoyed the experience. However, coming to the cons, I found it highly scented. I didn’t like the taste of the artificial flavour. It also had a strong sense of coconut in it which just didn’t seem right to me. However, I know that I can’t base a review of a bakery on just one cake, so I inquired from my friends who have been here and they only had good things to say. Their most delicious cakes are supposed to be the Black Forest and the Chocolate cakes. They sell 1/2 kg and 1 kg cakes for which are customization as per requirement is done. That is the best part. Your cake is tailor-made for you. I was going through the menu to check the prices out. There are multiple other bakeries that are priced lower than this one and I will say that the price is definitely on the higher side. However, given the customization aspect and the quick delivery, it definitely deserves a try. I will recommend this place for you to give it a shot. The cakes are fresh and high in quality. I just read Transitions and Beyond (4) by Inderjit Kaur. I wasn’t very sure what to make of it at first. I found it utterly confusing and weird. But then upon trying to analyse it, I liked how it shows a piece of a puzzle, a direction moving across a cracked path and growth among rubble. It sent many motivational messages to me though I wished it could be represented in a more attractive way. The title is perfect. It’s apt for the subject which is about change from a disorganized and haphazard way of living. It also promises of teaching something more than just that. I liked how it sounds. The main focus of this novel is how the right way you transition from your existing way of life can drastically change how success comes to you. It speaks about structure, modification and dedication, all of which are essential to be able to move forward from an unclear future. There is immense positive feeling that one derives from the way the author has portrayed these lessons. Additionally, in order to make it more catchy and memorable, the lessons and motivational guides are split into modules. This is another strong point which makes implementation quick and easy. to elaborate, there are a total of three modules. The first is ‘The Change’ which speaks about exactly that. It highlights some very valuable points about how a person develops a patterned way of living which needs to be altered to succeed. The second is ‘Interventions’ which is more of a self-analysis about the present and the progress. This is the one that contains the most depth and philosophical teaching. Lastly, we have ‘Revive and Renewal’ which is like a refresh button to your own life. It is acceptance, understanding and tolerance. What really struck a chord with me in my personal life is how the concept of change and stress merge into one another. This was something I could relate to very well. The knowledge derived may not be completely new, but it is, to the most extent, quite catchy and read-worthy. That is the strength of this work. The writing style is simple, to the point and lacks any major grammatical errors. Though the information is probably something we’ve thought about every now and then, the presentation is excellent and I found the book worth my while. I would recommend this to someone grappling with life or struggling to strike a chord with difference. I just read Principles of Success by Roopleen. In an ocean of fiction, this self-help book shines through. I like how refreshingly different the cover is, with the title written in a tilted fashion to represent the steps of success. That is how I deciphered this cover, and I really found it innovative. Hats off for this aspect. Given that this is a non-fiction, I am not going to rate the title the way I usually do the rest. I found this one apt to the subject and it complimented the author’s intentions perfectly. To keep it simple, this book highlights the fourteen steps that one needs to take in order to achieve success. Each of these principles is divided into chapters, making this read very effective. I found it quite engaging and since I don’t have the time to complete a book in one go, I was able to read a couple of chapters at a time and still retain the depth of the content. For this reason, I applaud the author. She ensured that each of the steps is clearly distinguished so the reading from a previous session doesn’t go in vain. Additionally, in order to make it more catchy and memorable, the lessons and motivational guides are split into bullet points. This is another strong point which makes implementation quick and easy. What really struck a chord with me in my personal life is how the concept of happiness and success merge into one another. This was something I could relate to very well because I’ve often struggled with these two components of life. Somehow, this read eased that stress for me. Though the information isn’t all brand new and is probably something we’ve thought about every now and then, the presentation is excellent and I found the book worth my while. 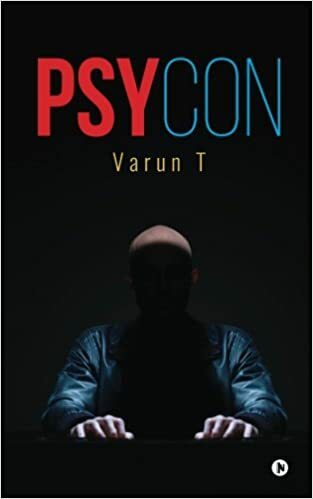 I just read Psycon by Varun Tejwani. What started with apprehension ended with amazement. I love how the cover has an element of suspense and mystery to it. Darkness is the most intriguing factor and upon first look, it develops in readers a sense of curiosity. Good job on being able to do that. The title is a conglomeration of what I presume as psychological and a con based story. It is unique and unlike any other I’ve seen. I like the build it presents of the story, leading to a variety of guesses about the plot. This novel falls broadly into the genre of a Political Thriller which revolves around the IT department, black money and corruption. It builds slowly yet steadily into a massive tale of gripping suspense. It falls rightly into the thriller category as the author has beautifully woven a serious masterpiece. The infusion of ‘Satyameva Jayate’ with ridiculed patriotism and the intervention of CBI are commendable, to say the least. The story revolves around Prateek and Yashwardhan who constitute ‘Psycon’ in an attempt to get involved in the ruling party’s regime and con their way out with massive wealth. The writing style is strong with a good sense of language and grammar. It is an easy ready and will keep you hooked till the end. The plot compliments the author’s sense of satire. If you are into a thriller of its best kind, then Psycon is the book for you. Pick it up, give it a shot and you are sure to be enthralled. This will be an excellent addition on your shelf. I guarantee it. It is available both as an e-book as well as paperback and the best part is that whatever royalty the author makes from this book gets donated to the Prime Minister’s National Relief Fund. I just read The Moon in the Sun by Sanjay Kumar Singh and found it quite refreshing. I loved the symolism of the novel though I did not find it to be very attractive. However, the plus points are the strength and the vibe that resonates from it. My only complaint is that I found the title quite long and difficult to remember. It comes with a byline ‘A novel in the poetry of love, life, soul and wildlife’. I really like how it all sounds though I thought it could have been shortened a bit. The main title is witty, catchy and quite mesmerizing. The book is a lot different from most that I’ve read which is why I will definitely give it brownie points. The author is clearly fascinated by the natural aspects of livelihood which shines through the book. The main plot centers on how the protagonist finds his oneness with nature and wildlife. What really moved me was the interception of the tiger in this person’s life and their similarities which was the underlying factor of the novel. It is incredibly difficult to portray these aspects but the author has done a very good job. It is obvious that he put his heart into it. The book is a pleasurable read with interesting scenarios and moving scenes. Do opt for it if you are a nature lover or if you would love to discover how much it affects our lives. Hi there! This week, I had the opportunity to interview one of the youngest and most dynamic people I’ve met. He is packed with ambition, a steady goal and a bright future ahead. Introducing to you all… Kevin Missal! In this first section, we covered the basic questions and asked the obvious. Of course, for you to understand the future goals of Kevin Missal, you need to know a bit about Kevin Missal first, right? Let’s get right into it! I can craft good stories and entertain them. Q2: Tell us a little bit about ‘Karma’ – the world’s first Instaread. Small, compact and could be put in a pocket. It was initially a short story written for an anthology but when the anthology didn’t work out I thought of publishing the story since it had an entire structure with a lot of characters. Karma is about grief, loneliness, superstition and madness. Q3: Are there going to be more Instareads? Oh hell, there are gonna be a series of it. Q1: What does ‘Kalamos Literary Services’ mean to you? A business that needs to spread creativity. Q2: What is it about writing that inspires you? You are the sole reason behind the disappointment and the success of your writing. You are not dependent on anyone. That’s what inspires me. I hate to be dependent. Q3: What is your favourite genre to read and why? It ranges according to my writing period. If I’m writing mystery, I’ll love mystery novels and if I’m writing fantasy as I am now, I am reading the Wheel of Time by Robert Jordan. And I love fantasy now! Q4: What do you do besides writing? I read, watch Netflix, hang out with friends. Dad. No doubt. He’s always the greatest supporting force, always pushing me and always funding me. Haha. At the age of 12 when I scribbled a page on my notebook realizing I can write a story too. I thought I’ll finish the entire notebook but it turned out I couldn’t since the story wasn’t fleshed out. Q3: Who, from the literary world, would you want to be like in the future, but in your own individualistic way? I think Amish is a marketing genius so I want to learn marketing from him, and I would like to write more like Stephen King and earn money like JK Rowling. Q4: When do you plan to write your next book? I’m already writing. Finished 13,000 words in two days. It’s going to be my magnus opus. Q1: How did the concept of ‘Instaread’ come about? I was at an airport and I had bought a book which was too heavy to carry around and you know how we have to keep moving till we reach the plane. I kind of thought wouldn’t it be cool if there’s a book with a beginning, middle and an end having concrete, well rounded characters fit in your pocket? The idea stemmed and after discussions it just blossomed. Q2: How did you come up with the idea of ‘Karma’? Rakshas has always inspired me to venture in the darkness of rebirth and reincarnation. Like in the movies, reincarnation isn’t so pretty. It’s bad and sometimes you return as a rakshas or a pisach. Q3: How do you envision your future? A successful writer penning screenplays as well. I would have been a very boring boy with no sense of purpose. Thank you, Kevin, for such an interesting interview. You can order ‘Karma’, the world’s first Instaread, from Amazon today. Isn’t it tiring to have to come up with something new and different every single day? Does your WhatsApp status make you wish that you could come up with something better? Would you like to have a status a day to keep your WhatsApp trendy and admirable all the time? Then Whats Status is your one stop destination. In the mood for something romantic? Try the Love WhatsApp Status. Are you the philosophical kind that believes in motivating others? There’s place for you too in the Inspirational or motivational sections. Be it a sad status, an emotional status, an angry status or something absolutely crazy… you have over 60 categories to choose from. Whatever mood you are in, you’ll have an update created just for you. With new and unique statuses added each day by the growing community of over 70000 writers, Whats Status makes sure that your WhatsApp Status is updated all the time. Get on to the website, make your choice over 18000 statuses and just let your WhatsApp become awesome again. Your friends are bound to compliment you over your wit and trendy status updates for sure! What’s more is that you could use a lot of these as regular messages too, whether it is to apologize to your girlfriend, show your spiritual side to your relatives or even to look cool among your friends. So hurry up and head over there right now!